August 3. I ordered a canoe. Stan had contacted the canoe maker a couple of weeks ago to put in my request, so today we went to Utwe to check on its progress. 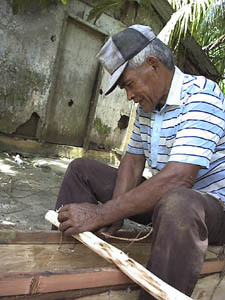 The canoe maker is Clyde Nena. He generally does the work himself, but will have others assist on occasion. 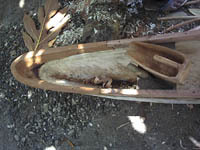 Canoes in Kosrae are carved out of a single tree trunk; usually either the canoe tree (which I think is an almond, and often is referred to as a "forest" tree, because that is where it grows) or a breadfruit. 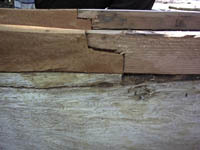 The former has a nice white wood, while the latter has a reddish wood. Both trees grow straight and tall, and achieve a great width. At one point in Kosrae's history, someone imported Eucalyptus trees, which also grow straight, tall and wide. However, canoes made from this wood generally cracked or quickly absorbed water and became slow and listless. The use of this wood for canoes was quickly abandoned. 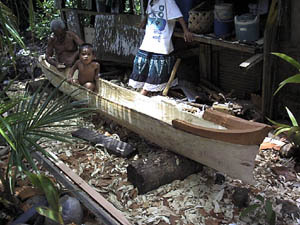 Kosrae has several different kinds of canoes, or at least it did in its history: ocean-going canoes, racing canoes, local around-the-reef canoes. No one really makes these anymore. 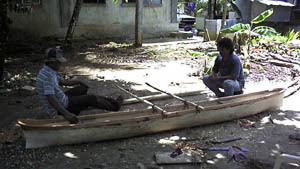 The canoes you see today are mainly used for carrying cargo to the market. They are still quite nicely shaped, and usually move through the lagoon or just outside the reef with paddle and pole. 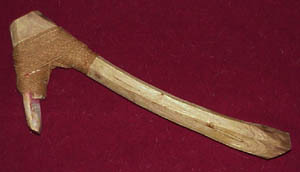 The principal tool used in carving a canoe, or for that matter carving anything out of wood, is an adze. 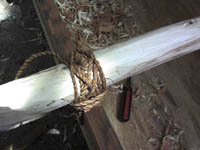 The adzes of today are nothing more than an adaptation and modernization of the adzes used in the past; the only difference seems to be that a metal bit replaces the shell or stone bit. Some of the first Europeans to visit the island at the beginning of the 19th century gave the Kosraeans metal axes. 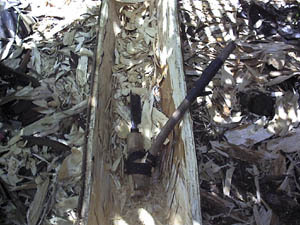 These were tried in carving of a canoe; however, they cut too deeply into the wood and generally could not be controlled. The Kosraeans dutifully thanked the Europeans, handed the axes off to a chief as tribute, and returned to their shell adzes in completing the canoe. 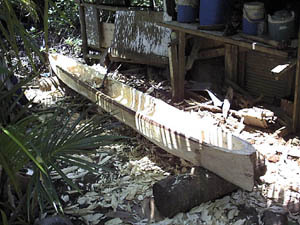 Our canoe had not been started, although the tree was cut down and awaited some roughing-out work before a section of it could be taken to Clyde's house. What we saw today was someone else's canoe under construction. August 9. Our canoe has been started. We visited Clyde Nena in Utwe today to see what progress has been made. He started work on it Saturday afternoon (no work on Sunday), and already it is roughed out. 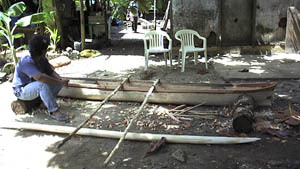 It is a small two-man canoe, about 12 feet long. It will be a complete outfit -- canoe, an oar and a bailer. 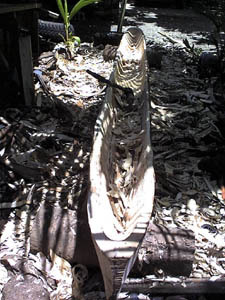 The canoe is made from the "canoe" tree. 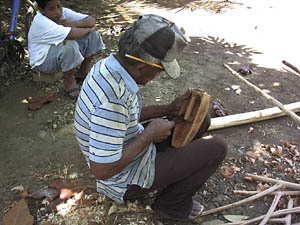 The adze he is using... Well, it's an adze. 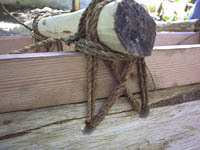 I don't think adzes have changed too much over time, other than perhaps to substitute metal for shell or stone. Otherwise they are the same just about everywhere you go. There are small adzes (more like chisels, really), and much larger ones. 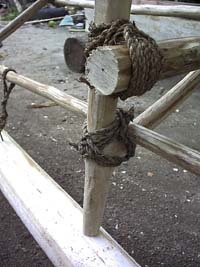 But all serve about the same purposes, as far as I can tell -- hewing wood, whether to make a canoe or to build a house. 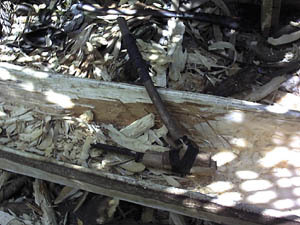 Many Pacific archaeologists will argue about whether adzes were used for woodworking at all. Their argument generally is that the shell will break as soon as it smacks a log. Having recovered a few, and seen quite a few over the years, I would say that their edges get dulled, but it is nothing to resharpen them. And considering that there are enough of them around, many in complete form, they must have been used for something more than mere decoration. August 12. I wanted to go see Clyde and the canoe today, but Stan discouraged that. 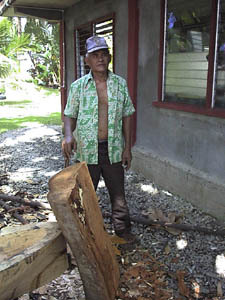 He said Clyde's wife was leaving for Pohnpei today, which meant they would be busy with preparations for her departure. But, I can go anytime tomorrow; Stan would call ahead and let him know I was coming. Clyde doesn't speak English. August 13. I made it down to Clyde's today. The canoe is taking shape. 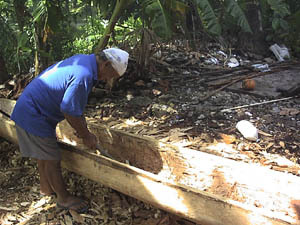 Its walls are much thinner, and there is a lining of breadfruit in the front of it and part of the canoe/almond tree lining the rear. Clyde's granddaughter (or niece; these relationships are sometimes difficult to translate) said the canoe should be ready by Monday. August 17. This is my last week in Kosrae, which means completing last-minute tasks. Today, Nena and I returned to the Finlesr Lap site to sample the pigment for a geochemical analysis. But this was only part of our schedule for the day. The main attraction, so to speak, was a visit to Clyde's to see if the canoe was done. It is nearly completed. 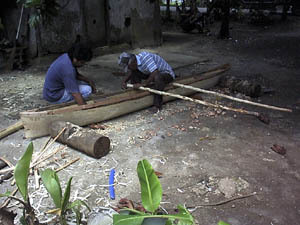 When we arrived, Clyde was tying the boom and outrigger onto the canoe, and shaving a bit more out of the bailer (carved from breadfruit wood). Nena and he had a long conversation, of which I didn't understand a word because it was all in Kosraean. Nena told me later he asked how Clyde measured the canoe; how many fathoms was it? Clyde said it was two fathoms plus a foot. Nena then asked how he came up with that length. He thought Nena was a little daft, I think, and responded, well of course, everyone knows a fathom is the extent of your arms held out from your side, and that is how he came to the length of two fathoms plus a foot. 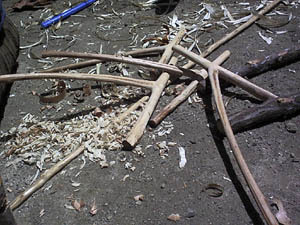 Arms and other elements that attach the outrigger to the body: mangrove wood (which is very hard). Nena Lonno teased me --- looking at the bailer (made from breadfruit), saying how much better a Clorox bottle is for a bailer, not one of those little things. I protested, saying I preferred the traditional type. Clyde just laughed at us. I don't know what kind of nut I am holding, but it is used as the base for the sealer in canoes. 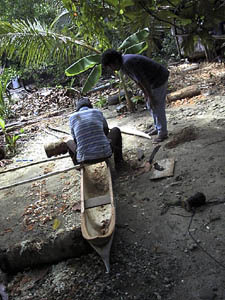 Its oil is also mixed with the "lap" (red pigment from Finlesr) and then painted on canoes, adze handles and so on. Berlin didn't know how the oil was prepared; all we know is that it was derived from the nut inside this rather thick shell. 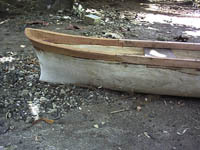 The canoe still needs a bit more finishing work; however, it should be ready tomorrow. We will be loading the shipping container then, packing it away for the journey home to California.